Bike to Work Day is May 10—are you ready? Do you have a bike that's been gathering dust? Flat tire, creaky chain, sloppy shifting and squishy brakes? 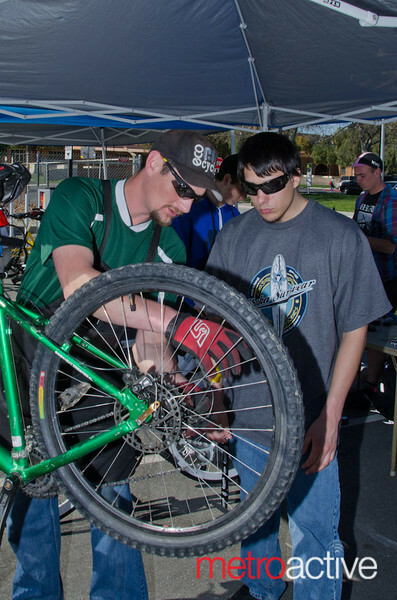 Bring your bike down to the San Jose Bike Clinic Bike to Work Gear-Up on April 29 from noon to 4 p.m., and we'll show you how to fix those problems yourself, as well as provide you with a checklist so you know how to look for these problems on your own on May 10. Or, just come and hang out! What: Bike repair and route planning classes, bike stands and tools so you can wrench under the guidance of our bike repair coaches, a safety ride to refresh your memory or teach you how to ride safely on the streets. We can even give you a personalized expert consultation on route planning! When: Sunday April 29, noon to 4 p.m.
Where: San Pedro Square Market, Saint James and San Pedro streets, Downtown San Jose. RSVP: Please RSVP if you can attend, and share with friends, at https://www.facebook.com/events/373591872685809/. More Info: If you have questions or comments, visit www.sjbikeclinic.org orwww.facebook.com/SanJoseBikeClinic and leave a comment. This is awesome, however the event is happening on SUNDAY, not Saturday. Thanks!